What great news today! Prince Andrew has agreed to become the patron for the International Festival for Business 2014 to be held in Liverpool in June and July. This is just one of the main cultural events happening in our City this coming 2014 year. Not since 2008 will there be as many events and amazing arts and cultural festivals that will not only highlight this wonderful city but will encourage thousands of tourists and businesses to participate and enjoy the hospitality that our city is renowned for. DO NOT go anywhere this summer… Here are some of the events I will be looking forward to and you may need to put them in your diary now. 25 May sees our Rock and Roll marathon and half marathon and an incentive to get fit and enter this iconic event is a free admission to the Finish Line Festival and Concert that follows the event. 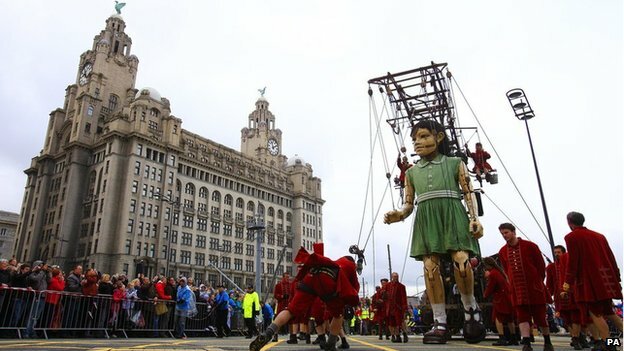 23-27 July will see the Giants return as part of the World War One Commemorative events. 5 July – 26 October 2014 Liverpool will host the Liverpool Biennial 2014, the largest International contemporary art festival in the UK. Happy Days to come. I cannot wait!